According to the report, the global automotive seat belt height adjuster market is likely to be driven by a range of macroeconomic, technological, and industry-specific factors. Asia Pacific is expected to be at the forefront of global demand, with the market in the region expanding at a CAGR of more than 4% between 2019 and 2027. Automotive seat belt height adjuster is part of the seat belt system in vehicles. It is a component that aids the driver and passenger to adjust the shoulder height of the seat belt. Vehicle fitted with an automotive seat belt height adjuster results in more comfortable and pleasurable ride, by providing the driver an appropriately positioned seat belt so that it doesn’t rub against the face or neck of the driver or passenger. The automotive seat belt height adjuster can be incorporated in any existing seat belt in the rear seats of cars, mini buses, and coaches. The popularity of seat belt height adjuster is rising, as it reduces the discomfort for passengers and the driver by offering proper adjustment of the shoulder height of the seat belt. This is boosting the adoption of the automotive seat belt height adjuster in majority of vehicles. Currently, safety and comfort while driving, primarily during a long journey, are major demands from automobile end-consumers. Vehicles integrated with seat belt height adjuster offers maximum comfort, convenience and safety to both front seats through adjustment of the height of the shoulder belt anchor. Moreover, it prevents the seat belt from rubbing against the motorist’s neck. These factors are likely to augment the automotive seat belt height adjuster market during the forecast period. Rubbing of the seat belt against a child’s neck results can lead to considerable discomfort, which occasionally encourages and prompts the child or teenager to place his or her arm over the seat belt. Consequently, the probability of a child or infant popping out of the seat while hard braking is significantly high. The automotive seat belt height adjuster prevents children from placing their arms over the seat belt. This, in turn, is likely to gain significant popularity in developed countries such as the U.S. and Europe. Improper adjustment of the seat belt height might reduce its efficacy in case of an accident. This is anticipated to restrain the adoption of mechanical seat belt height adjuster, where human intervention and supervision is required to adjust the shoulder height of the seat belt. Replacement cost of the seat belt height adjuster is quite high, especially of electrically operated seat belt height adjuster, as it uses sensors to ensure safety and comfort while adjusting the seat belt height. This is another factor that is projected to hamper the adoption of seat belt height adjuster. In terms of technology, the manual segment held a dominant share of the market. It is likely to remain a prominent segment during the forecast period, primarily due to low maintenance and replacement cost of manually operated seat belt height adjuster, as compared to that of automatic operated which are quite expensive, in conjunction with longer lifespan have led the segment to hold a noteworthy share of the market. However, the automatic segment is projected to expand at a healthy pace in the near future, owing to cost cutting of mechatronic components in order to ensure more comfort and safety. In terms of seat, the front segment accounted for a prominent share of the market. This is primarily attributed to the preference for driver’s safety and comfort while driving. Majority of the new modern vehicles on the road today are integrated with front seat belt height adjusters. These are particularly helpful as the impact of collision on the front seat is comparatively higher and improper adjustment of the seatbelt may result in severe injuries. This, in turn, has prompted manufacturers to integrate seat belt height adjusters for front seats in a higher ratio. The passenger vehicle segment dominated the global automotive seat belt height adjuster market as compared to the other segments. It is anticipated to maintain its dominance during the forecast period. Higher production of passenger vehicles supplemented with a surge in the adoption of comfort and safety equipment in vehicles are key factors that are anticipated to boost the passenger vehicle segment of the market during the forecast period. The utility vehicle sub-segment is anticipated to hold a prominent share of the passenger vehicle segment of the market in the near future, especially SUVs as they offer driving comfort and drivability on off-road conditions. These factors are likely to propel the automotive seat belt height adjuster market during the forecast period. 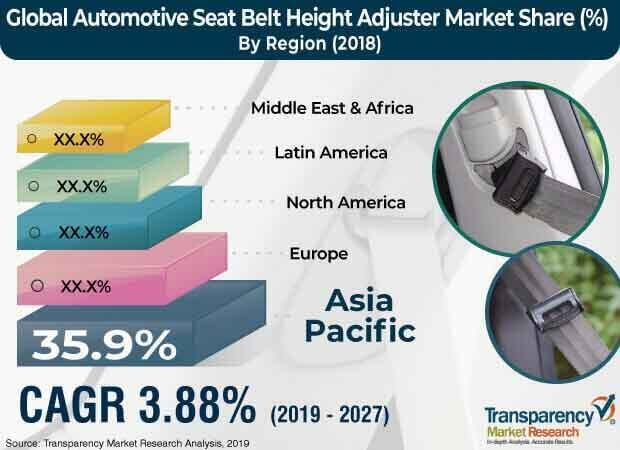 Based on region, the global automotive seat belt height adjuster market has been segregated into North America, Europe, Asia Pacific, Middle East & Africa, and Latin America. Asia Pacific is estimated to be a highly lucrative market, owing to rising vehicle production in China, Japan, and India. Entry of premium automakers in the region is also boosting the automotive seat belt height adjuster market in the region. Asia Pacific held a dominant share of 35.95% of the global market in 2018, as China accounts for more than 25% of the total global vehicle production, and vehicle production in China is rising at rate of more than 4%. Prominent players operating in the global automotive seat belt height adjuster market include APV Safety Products, IMMI, Autoliv Inc., Beam's Seatbelts, BERGER GROUP, Far Europe Inc., Goradia Industries, GWR Co., Joyson Safety Systems, IMMI, Robert Bosch GmbH, Seatbelt Solutions LLC, Saikai Vehicle Industry Co.,Ltd., and ZF Friedrichshafen AG.